Don’t have quite the cuddliest cat in the world? Were hoping to have a nice snuggle with your feline friend here or there but are finding it’s just not happening? Wish your pet liked to be petted more? While it’s not always possible, it’s likely that you can turn your cat into at least a little more snuggly version of him or herself. Just use some of the ideas below, which are all easy to do, and your cat will hopefully begin to be more happy with petting and cuddles in no time. 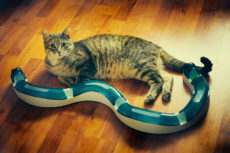 Your ultimate goal is to help your cat associate “happy” and “good” with being pet. This takes time, especially if you have a particularly grumpy/non-affectionate, or even standoffish cat, but in my opinion, it’s completely possible to train every cat to be at least a little more snuggly and happy about being pet. 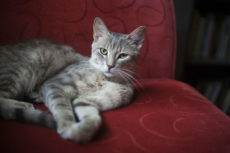 Not every cat is the same, and thus, some of the following tips may work for your cat, others may not. 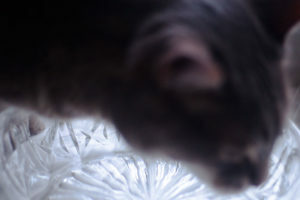 Continue to use the ones your cat seems to like, and don’t use ones he or she appears to dislike in any way. Also, a word of advice: When you first start off the process of trying to make your cat happy to be more snuggly, don’t pick your cat up when you’re petting him/her. Cats barely like to be picked up as is. If you associate petting with being picked up – it’s not going to help you in your quest to associate “happy” and “good” with petting. 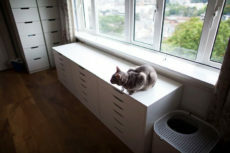 Pet your cat while he/she is sitting down calmly at the window. If your cat really likes to be brushed, pet your cat very gently while you are brushing him/her. Right before you put down food for your cat, pet your cat a little bit, then put down the food. Pet your cat (not on the head or face, but on his/her back/sides) while he/she is eating. Give your cat a snack while simultaneously petting him/her. Pet your cat gently while he/she is comfortably asleep. 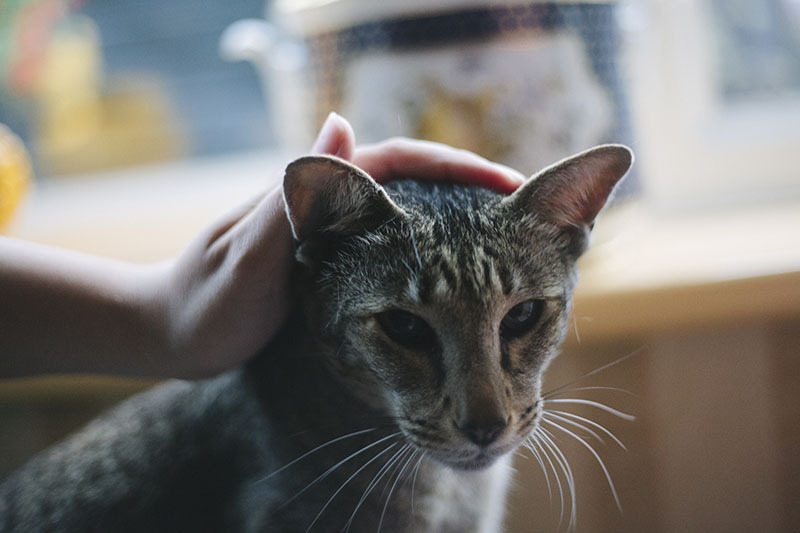 Place your cat in your lap, then immediately give a treat to reward him/her for being there. If your cat stays in your lap, confused and hoping for another treat, give your cat another treat to reward him/her for staying there. 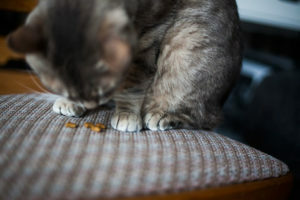 Give your cat unexpected treats (treats can just be dry kibble) throughout the day. This will help your cat to associate seeing you with happy thoughts of potentially getting food. Make sure you play with your cat regularly (at least once a day). Sometimes cats are aggressive simply because they haven’t had enough play time. Well, there you have it. Seem pretty straight forward, don’t you think? But I Don’t Want My Cat to Be Overweight! 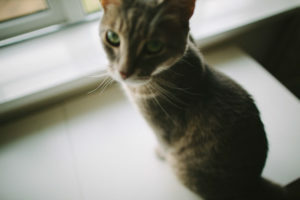 Yes, a lot of the tips and tricks in this article are kibble related, but because I use this simple trick to prevent overfeeding, I’ve never had issues with my own cat, Avery, gaining extra weight before and I know if I stick to using this trick, I never will. Don’t feel like checking out the article I linked to? Just want the shtick? Basically, measure out your cat’s food portions (including all meals and treats) from the start of the day, have all this food in one or two containers, and only feed your cat from this portion for the entirety of the day. 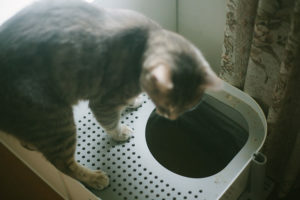 If you never pull out any extra, your cat is eating the right amount each and every single day no matter how many times you pull out the feeding jar. Note that you can get away with feeding a cat snacks that aren’t cat food, and maintain tip top health, if all snacks combined (including dental treats) don’t equal over 10% of your cat’s calories consumed per day. Want to make sure you never even remotely near hit this in one fell swoop without limiting yourself to never giving out treats? Buy a kibble different from your cat’s standard meal and use that as a “snack” food. I like to use a kibble that’s by the same brand I am currently using for main meals, but with a different protein source (like salmon if my main food is chicken), since it’s advisable to give cats food from multiple protein sources to keep them in the best shape long term. More Ways to Train a Cat to Be Snuggly? I’m betting after having seen my ideas for ways to train your cat to be more snuggly, you’ve thought up some of your own! Share them with me in the comments so we can help other cat owners who are trying to help their cat to be a little happier about being pet! 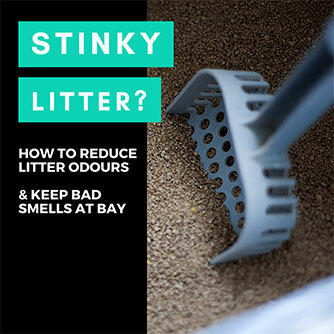 You’d likely be helping a lot of cat owners with your advice! 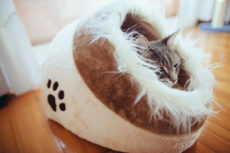 Self-Warming Cat Beds: So Cozy, Kitty May Never Want to Leave! My Cat’s Scratching Furniture! How Can I Keep Claws Off the Couch? Hi, I have a question for you! I found two kittens by the side of the road, and they are about 10 weeks old and terrified of people. One is more trusting than the other, but they both run if I try to slowly approach. How do I get through to these kittens? I’ve had them for over two weeks and have made little to no progress. Heyya Sally! 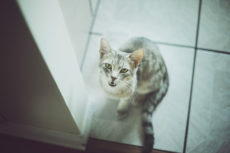 Try going through my article on how to train your cat to stop running away form you – those tips should help you more than these. Let me know if you have any trouble/further questions! I train my cats starting with the first time we meet by making a noise (periodic clucking or a blown kiss) whenever they are purring. After a short period of time they associate that noise with good feelings. I then use that noise whenever I want them to feel assured. My cats start purring whenever they hear that sound and run to me. I continue to use that sound whenever I know they are particularly please to keep the association strong. We have a cat exactly like this, that growls. Not a mean cat, likes being petted, just hates being held and won’t stay in lap. Giving him Treats works a little, but then he gets aggressive wanting more treats. Odd thing our grand daughter discovered, he loves being under towels or pillowcases or under boxes. So now we put him in lap and covered with towel and he settles for five minutes or so. Big progress. I’ve seen it called swaddling. It works. We can do anything to him if he is wrapped in a towel. Just came across your blog this morning and I have already read through 90% of them. 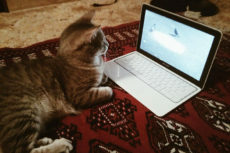 Such a great resource for cat-parents. Thank you! I recently adopted a shelter cat who developed an upper respiratory infection within days of being home. Even though he has fully recovered, my once overly affectionate lap cat has become more inclined to sitting on his own blanket. He’s also developed a tendency to bite in response to being cuddled and a tendency to bite whilst I sleep. I had to take him to the vet three times in the first two weeks of bringing him home and, although it helped tremendously, he loathed having the humidifier on! Although some of the behaviors are improving (with a great deal of effort from my side), I feel like my little boy was so stressed out from being sick and having me trying to make him feel better that he has lost trust in me. 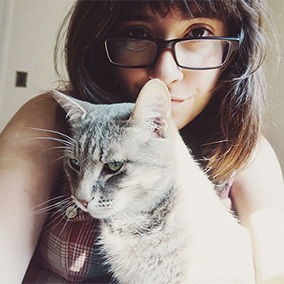 Your blogs have given me faith that I can win over my little guy, and have him be the cuddly lap-buddy he once was. Thanks, Rooksaar, and thanks for your follow up question by email! For anyone else in a similar boat, I spoke about Rooksaar’s situation in my post about cats’ behavioural changes after being sick here. I have a former stray and she is amazing. And I learned a lot from her vet. 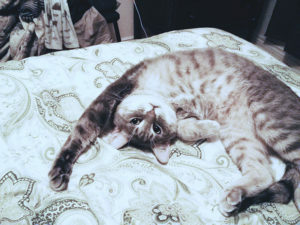 Cats seldom like to be on their back when held. So hold them tummy down with one arm supporting the hind end as well as the front. Much like a football or baby hold. 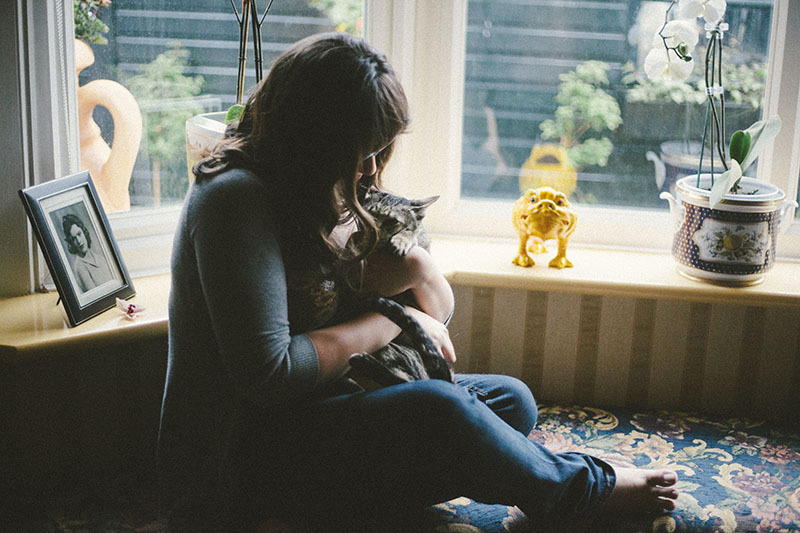 That’s very true – the way you hold a cat makes so much difference! I found my cat at the supermarket. When lying down, she was very afraid when I touched her, and started biting. It took me 2 years to be able to touch her when lying down. So you have to be patient. We had to do this with our cat Misha! After adopting her at the shelter, she was very stand-offish and afraid. We think she may have been abused or had a bad life before coming to us, so we had to take it really slow and gentle. She’s still very shy, but two years of nothing but love and affection have done wonders, and she regularly sits next to me when I’m working for a quick cuddle. That’s amazing! Love seeing progress; no matter how small at first it really does get a lot better over time!